Head on over to Amazon.com where you can score the Echo Dot 2nd Generation for only $29.99 shipped (Retail $49.99). Be sure to scroll down on this page and get a TP-Link Smart Plug for only $5 with the purchase of the Echo Dot – when you click the 'Add Both To Cart'. This is a really sweet deal, as the Smart Plug is regularly $22.99. 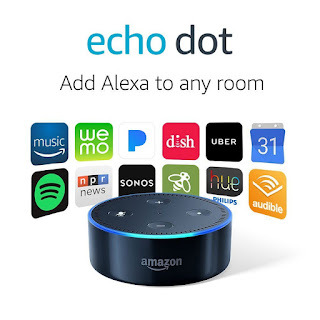 The Amazon Echo Dot is a voice-controlled device that connects to your speakers or headphones via Bluetooth or audio cable and then connects to multiple smartphone apps to control music, check the weather, check sports scores, listen to audio books, and more instantly. Pair with Smart Home devices such as your thermostat or lights – the Echo Dot can adjust the thermostat or dim the lights when you ask!